Healthy White Bean Tortilla Pizza is a great option for a lighter appetizer to have for a get together during the busy holiday season. 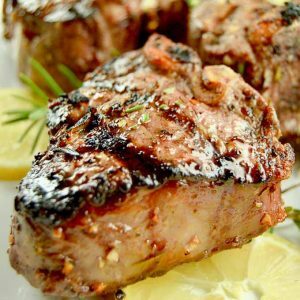 Your guests will love all the flavors and appreciate that its a lighter option with all the heavy foods that happen during the season. 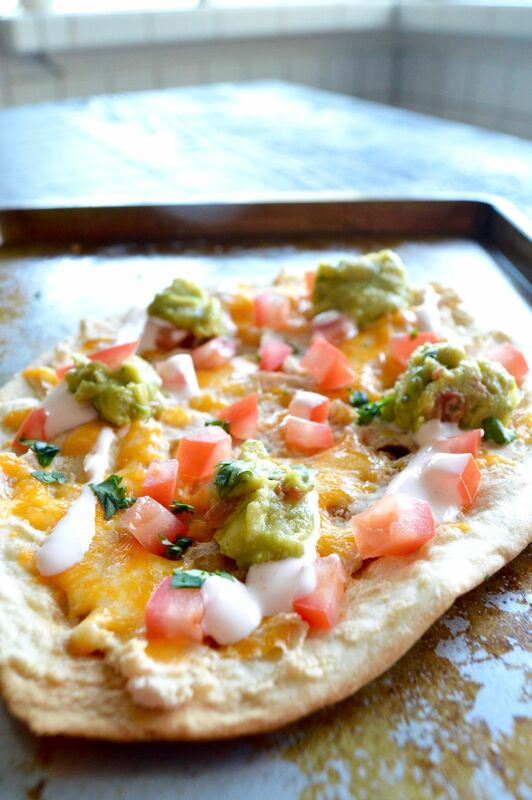 Healthy White Bean Tortilla Pizza is a family favorite at our house. While it’s packed with lots of great flavors the best part about the recipe is it doesn’t take a lot of time to make! I’d like to thank GoodFoods for sponsoring todays post. While I was compensated for writing this post, all of the opinions and reflections are my own. Their products are a natural fit around the holidays at my house. There are many options to choose from ~~ Chunky Guacamole, Spicy tomatillo Guacamole and Pineapple Poblano Guacamole to name a few. All of their products are made from real ingredients with nothing artificial ever! 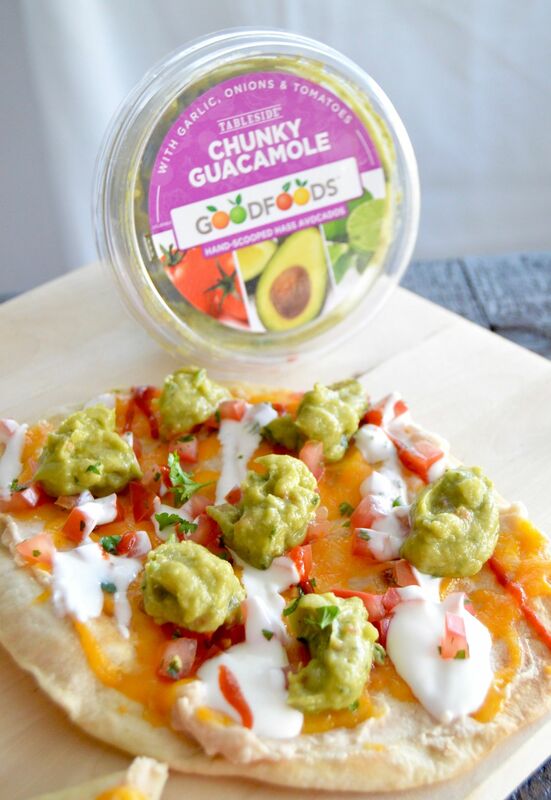 I found the Good Foods Chunky Guacamole to make this Healthy White Bean Tortilla Pizza at my local Sprout’s Market in the fresh produce section by the refrigerated salad dressings. You can find stores near you that carry this as well as their other guacamoles and dips that make entertaining so much easier at this store locator. We’re all so busy during the holiday season. Trying to find foods that aren’t super calorie laden and are very satisfying can be difficult. This Healthy White Bean Tortilla Pizza fits that need. 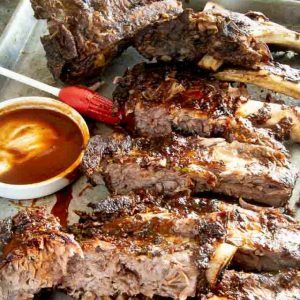 The fact you can make this recipe from start to finish in less than 30 minutes makes it a favorite in our house. 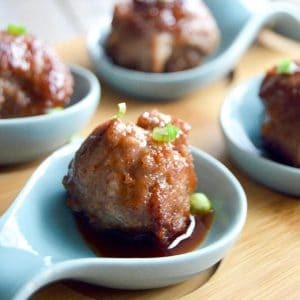 We make this often when gathering to watch Football or when having some friends over at the last minute for cocktails. 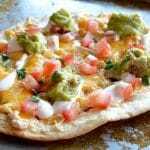 The white beans are pureed and used as the base atop the crispy baked flour tortilla on the Healthy White Bean Tortilla Pizza. By adding just a couple of spices you add a depth of flavor that rivals what you can buy at fancy restaurants. By making this at home you will be eating real food, prepared in a healthy way that has all the great flavors of the beans, melty cheese and the icing on the cake? The cold fresh chunky guacamole! Easy/Hard: Easy. I used an immersion blender to puree the beans like this one , but if you don’t have one you could just mash them with a fork. Thats the most labor required in making this Healthy White Bean Tortilla Pizza so I promise, its really easy. Serving Suggestion: This recipe works well with the Chunky Guacamole, but change it up a little and use the Pineapple Poblano Guacamole for a second option to serve with family along with cocktails. Drain can of white beans and rinse thoroughly. Using an immersion blender puree beans cumin and salt. (You can add up to 2 tablespoons of water to get to a spreadable consistency.) Set aside. Spray both sides of tortillas with cooking spray. Place tortillas on a cookie sheet and bake for 10 minutes until golden brown. Spread a thin layer of beans over the top of tortilla shell, leaving about a 1/4' edge. Sprinkle cheese over top of beans. Put bean and cheese covered tortilla back into the oven and bake until cheese is melted, about 7 minutes. Remove from oven and drizzle sour cream over top, sprinkle tomatoes and place a dollop of Good Foods Chunky Guacamole evenly over top of tortilla. Using a pizza cutter or a sharp knife cut into pizza slices and serve. Sprinkle with cilantro and sirarcha sauce if you desire. Nutritional Information was calculated using My Fitness Pal App using the specific brands and products I used to make this recipe. If you are following a strict diet, please note the information may be different using different ingredients and please plan accordingly. Tried this and loved it! A great meal that’s easy to make. This looks like a great combo! 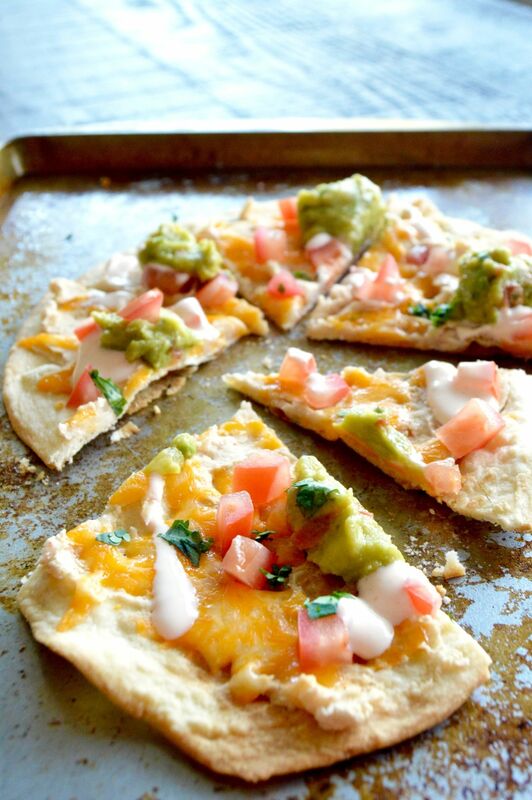 I LOVE guac on anything, and this combo of white beans and cheese and guac…yum! Id love this for lunch Martyn~ If your afraid of the tortilla getting soggy you could assemble it right before eating it at lunch! I have a family member that has turned to an vegetarian/all plant-based diet! He will love this! I love when people turn the classic definition of pizza on its head! 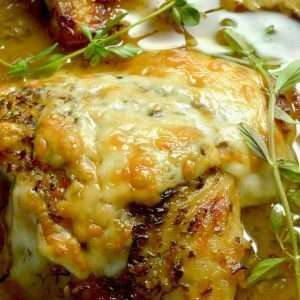 Using a white bean puree instead of traditional red sauce makes me love this even more! All that protein makes me hungry and feeling good about chowing on this with no regrets! Im glad you like in Jennifer! I like a protien laden option too!